‘Mama I made it,’ these are the words said by the executive member of Enactors Andile Fokane, who was raised by a single parent. 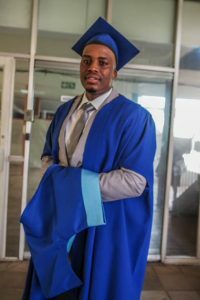 Andile graduated with his diploma in Retail Business Management during the 2019 autumn graduations. 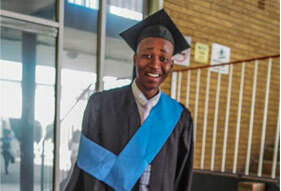 He was accompanied by his Enactors alumnus, Tshepo Matshaba who graduated with B-tech in Marketing. Andile said that his journey started in high school when he was selling T-shirts and had a dream of owning his own retail company that deals with designer brands. He first learnt about Enactors during his first year when they were showcasing what they do during orientation. He then had an interest to be part of Enactors, he is now an Events and Recruitment Manager. Andile showed the excitement of receiving his first diploma and thanked his mother for being there during his varsity days. 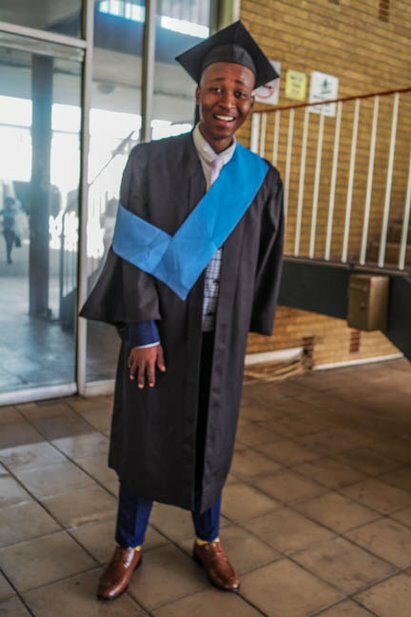 Not only was he excited but so was his Enactors colleague Tshepo Matshaba, who said the this is my second qualification but does not experience the same excitement like when he graduated with a diploma in Marketing. Tshepo is currently shifted to hospitality and his being trained by his uncle to take the family Babooshka Hospitality Company forward. He is being groomed to become the best chef and uses his Marketing skills to market the company as they still want to expand it and open more branches. Both the students said that it is nice to be a student but need to be a sober person, nice to party but know why you came to VUT.